Pollen, or flower sperm, is a fine to coarse powder consisting of microgametophytes (pollen grains), which carry the male gametes of seed plants (angiosperms and gymnosperms). Each pollen grain contains one or two generative cells (the male gametes) and a vegetative cell. This group of two-three cells is surrounded by a cellulose cell wall and a thick, tough outer wall made of sporopollenin. Pollen is produced in the microsporangium (contained in the anther of an angiosperm flower or male cone of a coniferous plant). Pollen grains come in a wide variety of shapes, sizes, and surface markings characteristic of the species (see photomicrograph at right). Most, but certainly not all, are spherical. Pollen grains of pines, firs, and spruces are winged. The smallest pollen grain, that of the Forget-me-not plant (Myosotis sp. ), is around 6 µm (0.006 mm) in diameter. Pollen reflects the male aspect of the harmonized positivity and negativity that are fundamental attributes of nature (protons and electrons in atoms, positive and negative ions in molecules, male and female in animals, etc.). The process of pollination via insects and birds also reflects the harmony of creation, as reflected in the philosophical principle of dual purposes, whereby each entity in the universe is linked together by a purpose for the whole and a purpose for the individual. In the case of pollination, plants provide benefit to the ecosystem by providing food for birds and insects, and those flowering plants that use insect and bird vectors are generally very colorful, showy, or fragrant, bringing joy to people. At the same time, this process is beneficial to the individual purpose of the plant, its reproduction. 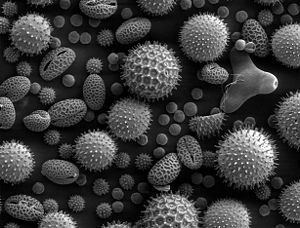 The study of pollen is called palynology and is highly useful in paleontology, paleoclimatology, paleobotany, archeology, and forensics. Except in the case of some submerged aquatic plants, the mature pollen-grain has a double wall, a thin delicate wall of unaltered cellulose (the endospore or intine) and a tough outer cuticularized exospore or exine. The exine often bears spines or warts, or is variously sculptured, and the character of the markings is often of value for identifying genus, species, or even cultivar or individual. Germination of the microspore begins before it leaves the pollen-sac. In very few cases has anything representing prothallial development been observed; generally a small cell (the antheridial or generative cell) is cut off, leaving a larger tube-cell. 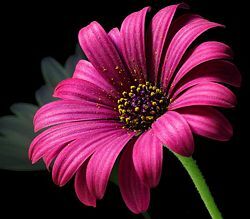 The transfer of pollen grains to the female reproductive structure (pistil in angiosperms) is called pollination. This transfer can be mediated by the wind, in which case the plant is described as anemophilous (literally wind-loving). Anemophilous plants typically produce great quantities of very lightweight pollen grains, often with air-sacs, and generally have inconspicuous flowers. 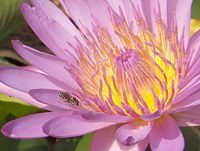 Entomophilous (literally insect-loving) plants produce pollen that is relatively heavy, sticky, and protein-rich, for dispersal by insect pollinators attracted to their flowers. When placed on the stigma, under favorable circumstances, the pollen grain puts forth a pollen tube which grows down the tissue of the style to the ovary, and makes its way along the placenta, guided by projections or hairs, to the mouth of an ovule. The nucleus of the tube cell has meanwhile passed into the tube, as does also the generative nucleus that divides to form two male, or sperm, cells. The male cells are carried to their destination in the tip of the pollen tube. Allergy to pollen is called hay fever. Generally, pollens that cause allergies are those of anemophilous plants, because the lightweight pollen grains are produced in great quantities for wind dispersal. Breathing air containing these pollen grains brings them into contact with the nasal passages. In the United States, people often falsely blame entomophilous flowering plants, such as the conspicuous goldenrod flower, for allergies. Since this pollen does not become airborne, however, these plants are not repsonsible for allergies. The late summer and fall pollen allergies are usually caused by ragweed (Ambrosia aratemisiifolia and Ambrosia trifida), a widespread anemophilous plant. Arizona was once regarded as a haven for people with pollen allergies, since ragweed does not grow in the desert. However, as suburbs grew and people began establishing irrigated lawns and gardens, ragweed gained a foothold and Arizona lost its claim of freedom from hay fever. Anemophilous spring blooming plants such as oak (Quercus), birch (Betula), hickory (Carya), pecan (Carya illinoinsis), and early summer grasses may also induce pollen allergies. Cultivated flowers are most often entomophilous and do not cause allergies. Pollen is sold as a nutritional supplement, marketed as "bee pollen" (even though it is, of course, from flowers). There is doubt among conventional practitioners that consuming pollen has any biological effect, although it may possibly cause allergic reactions in sensitive people. Many trees and flowering plants are a good source of pollen for honeybees. Bees will collect pollen from some grasses and grains when they cannot find pollen with more nutritional value; however, anemophilous plants such as grasses generally have very low real value to bees. Some windblown pollen is likely to be inadvertently collected by bees, since they bear a static charge. Ragweed and pine pollen can settle on leaves and other flowers, to add to the total quantity of pollen that are found upon analysis of gathered pollen. Palynology is the study of pollen and spores, both living and in fossil form. It is commonly used by geologists and paleoclimatologists as a means to study past environments, by identifying pollen and spore species at a certain stratigraphic interval, representing a given time in earth's history. It is also a useful tool for archeologists for gaining insight on the way past civilizations lived and the crops they produced, based on the pollen found in artifacts from that time. Palynomorphs are broadly defined as organic-walled microfossils between 5 and 500 micrometres in size. They are extracted from rocks and sediments both physically, by wet sieving, often after ultrasonic treatment, and chemically, by using chemical digestion to remove the non-organic fraction. For example, palynomorphs may be extracted using hydrochloric acid (HCl) to digest carbonate minerals, and hydrofluoric acid (HF) to digest silicate minerals in suitable fume cupboards in specialist laboratories. Samples are then mounted on microscope slides and examined using light microscopy or scanning electron microscopy. Once the pollen grains have been identified, they can be plotted on a pollen diagram, which is then used for interpretation. Pollen diagrams are useful in giving evidence of past human activity (anthropogenic impact), vegetation history, and climatic history. Palynology uses many techniques from other related fields such as geology, botany, paleontology, archaeology, pedology, and geography. This page was last modified on 4 April 2008, at 00:11.